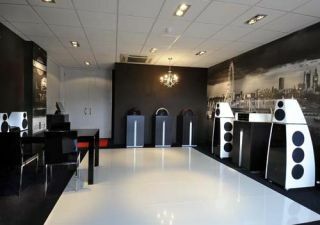 Meridian brings first boutique outlet to UK | What Hi-Fi? Meridian Audio has announced the opening of a new boutique store in Oxford. Due to open on March 16th, it's the company's first such outlet in the UK. Meridian Oxford will be a dedicated showcase for Meridian's AV products and will offer customers the chance to see the kit in action across various themed zones, such as DSP speakers and the Sooloos Digital Media System. The Oxford store will be operated by home automation and custom audio-visual specialists, Lewis Building Technologies, at its headquartes in Oxford. Meridian's first concept store opened in Bangkok, Thailand, in 2009, and the company plans to have ten stores by summer 2011, including two in Moscow and others in Kuwait, Bangalore, New Delhi and Singapore. 85% of Meridian's products are now sold outside the UK, with export sales for the Cambridgeshire-based company growing by 10% over the course of 2010. Meridian Audio's chief marketing officer, Graeme Taylor, said: "Demand for our hand-built products is increasing nationally, with particularly strong demand in the south east of England. "Oxford's geographical location and reputation globally offers Meridian a fantastic opportunity to respond to this interest with our own dedicated retail space."